Now that's a damn Halloweeny jack-o-lantern, y'all. And yes, your seven-year old could have done a better job carving it. It's tradition and it makes me happy. I like it! A traditional pumpkin face. 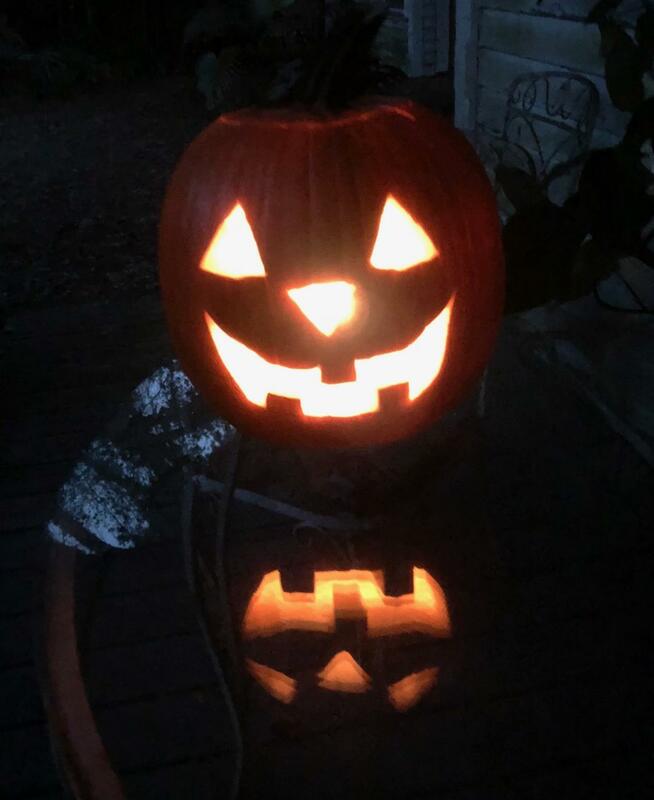 I used to carve a pumpkin every year even after my kids grew up until about 10 years ago. not really sure why I stopped. I even carved two cantaloupes one year when I was on a river trip during Halloween because that's all I had. we put little tea light candles in them that someone had for a candle lantern. With the kids gone, I have not carved a pumpkin for years, but if I did I would want it to look exactly like yours. cheerful, traditional, welcoming. That is indeed a very fine pumpkin! Kudos! That's definitely how a jack-o-lantern is supposed to look!